HULDUKÖTTR - Norse and Germanic Art: A Sold wallet. Brand new wallet we've done before the shop, it was sold to a Spanish customer some months ago. 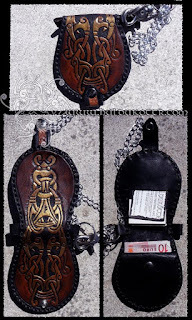 Carved pattern is own designed, based on Borre Norse style. Needless to say that all our works are customizable and we're able to make a whole new design for you based on anything you want, for a reasonable price. Of course, the chain is always optional. Skål! !